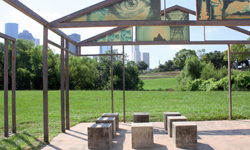 Passage Inacheve was installed in sight of the bayou in Buffalo Bayou Park in 1990. It is the work of artists Linnea Glatt and Francis Thompson. 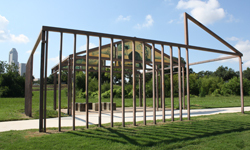 The 28’ by 28’ piece is constructed of galvanized steel set in a concrete slab with seating and visual images reflecting issues of human rights, freedom of expression, and historic and contemporary concerns. It has the form of a house but is completely open to the elements and to view from all sides. Linnea Glatt is a Dallas-based artist known for mixed media, almost minimalist sculpture. Francis Thompson has worked as an artist and teacher, and has a world-class reputation as an award-winning filmmaker.